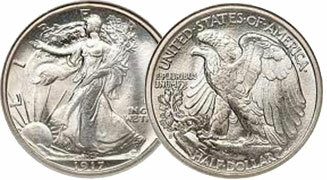 The Walking Liberty half dollar coin was a silver 50-cent piece or half dollar coin issued by the United States Mint from 1916 to 1947, and is considered to be among the most beautiful US coins.Note: Posted prices are for REFERENCE ONLY. Exact prices depend on dates, condition and current market. Better dates pay more.